The Barak Human Rights Protection Committee (BHRPC) has learnt that a new born baby died at a hospital in Assam within about 50 hours of his birth on 1 April 2012 due to negligence of doctors. An expectant mother in labour was brought to the S K Roy Civil Hospital in Hailakandi at about 1pm on 30 March. No doctors saw the woman and with the help of nurses she had to give birth to a male child. It was a forced birth. The conditions of both the mother and child started to worsen soon thereafter. Still no doctors in the hospital saw them. They then went to the Silchar Medical College and Hospital, Silchar (SMCH) and the baby died there at about 6pm on 1 April. It was the first child of the couple. 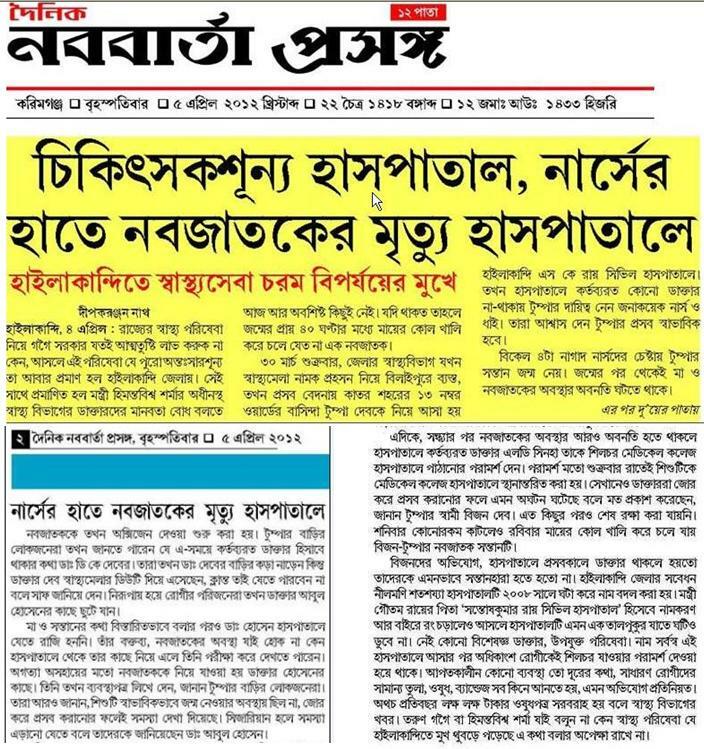 After the BHRPC first learnt about the incident from local newspapers (see 5 April 2012 issue of the Dainik Nababarta Prasanga, a daily Bengali newspaper published from Karimganj, Assam) on 5 April, it contacted the family and verified the information given in the newspapers and collected other relevant information. According to the information, the unfortunate parents are Mr Bijoy Dev and his wife Ms Tumpa Dev. They are residents of Ward No. 10,College Road, Hailakandi town in the district of Hailakandi. Mr Bijoy Dev is a small shopkeeper and provides the family from earnings of his pan shop (a small store where shopkeeper sells a mouth-freshener chewing item prepared by mixing different types of areca nuts, betel leaf, tobacco etc. according to order of the customer) that he runs in front of his house. His wife 20-years-old Tumpa Dev conceived the baby for the first time. After conception the couple were seeing Dr Shubhendu Chakrabarti regularly at his private chamber. Although Dr Chakrabarti is a government doctor posted at the S K Roy Civil Hospital he has his private practices like almost all other government doctors inAssam. Mr. Bijoy Dev stated that when Ms Tumpa Dev went into labour at the normal time on 30 March her husband and other relatives brought her to the S K Roy Civil Hospital at about 1pm. But there were no doctors on duty in the 100-bedded hospital. Dr Shubhendu Chakrabarti was in Guwahati, the capital city ofAssam. Therefore nurses tried to help her. After much agony and tribulation she delivered a baby at 4pm. It was a boy. However, his condition was critical. He could not breathe properly. The nurses started giving him oxygen. Meanwhile the father of the baby and other relatives were desperately looking for a doctor. They were informed by the hospital staff that at that time Dr D K Dev should have been in duty. They went to his residence. Mr Bijoy Dev’s older brother Mr Joydeep Dev and brother-in-law Mr Rajesh Dev urged Dr D K Dev to come to the hospital and do something to save the life of the new-born. Dr Dev told them that he was tired since he was at a health fair at Bilaipur, a remote village in the district for the whole day. He refused to help the baby in his fight for life. In the meantime, health condition of the mother also started getting worse. The relatives then went to another doctor of the hospital Dr Abul Hussain at about 10pm. He was at home but refused to visit the hospital. He asked them to bring the patients at his house. The mother and baby then were brought to the place of Dr Hussain who after examining them wrote a prescription. Mr Bijoy Dev told the BHRPC that Dr Hussain told them that the condition of the baby and mother became so serious due to the forced delivery. According to him, it was a fit case of caesarean section. The doctor told that he was of the opinion that if the delivery would have been caused through caesarean there would not be any complexities since the baby appeared otherwise alright. Mr Bijoy Dev stated that after they got the medicines prescribed by Dr Hussain from an outside drug store they brought the baby and his mother back to the hospital. One Dr L D Sinha came on duty next day morning. When the medicines prescribed by Dr Hussain failed to check the deterioration of the health condition of both the mother and her baby Dr Sinha referred the patients to the SMCH. At about 7.30 am on 31 March they were brought to the SMCH and were admitted in the department of obstetrics and gynaecology. Dr P Nath, an associate professor in the department examined them. Dr Nath also confirmed the findings of Dr Hussain that the forced delivery caused the complexities. According to Mr Bijoy Dev, the doctors and the staff at the SMCH tried their best to save the baby but he was declared dead at about 6pm. However, Mr Dev also informed the BHRPC that the hospital did not provide them with any medicines and he had to buy them from outside stores. This appears to be a clear case of causing death by negligence within the meaning of section 304A of the Indian Penal Code, 1860 if the opinions of Dr Nath and Dr Hussain are to be believed even if keeping in mind the rules laid down by the Supreme Court of India in Jacob Mathew Vs State of Punjab (2005) (Appeal (Crl.) 144-145 of 2004) for application of the section in cases of negligent and rash acts or omission of doctors. Most importantly, it is a prima facie case of violations of fundamental right to life as laid down in Article 21 of the Constitution of India. In a catena of cases the Supreme Court held that the right to health care is a part of the right to life. As a positive entitlement the right to health and health care is recgonised in Article 12 of the International Covenant on Economic, Social and Cultural Rights, 1966 which says: “The right to the highest attainable standard of health”. The General Comment 14 the Committee for Economic, Social and Cultural Rights states that the right to health requires availability, accessibility, acceptability, and quality with regard to both health care and underlying preconditions of health. This case is a glaring instance of gross violation of this universally recognised provision. Further, it is also a case of violations of relevant provisions of other United Nations convention such as Article 12 of the Convention on the Elimination of All Forms of Discrimination against Women, 1979 (CEDAW) and Article 6 of the UN Convention on the Rights of the Child, 1989 (CRC). At a time when the government of Assam is busy advertising its ‘achievement’ in the health sector with much fanfare it will be interesting to follow the actions of the government that may be or may not be taken in response to these specific allegations. “1. States Parties recognize that every child has the inherent right to life. This entry was posted on April 11, 2012 at 1:47 am and is filed under Child Rights, News, Press Releases, Report, Statement, Urgent Appeal, Violation Cases. You can follow any responses to this entry through the RSS 2.0 feed. Both comments and pings are currently closed.